Abstract: The number of vehicles is rapidly increasing. In parallel, the number of ways and traffic signs have increased. As a result of increased traffic signs, the drivers are expected to learn all the traffic signs and to pay attention to them while driving. A system that can automatically recognize the traffic signs has been able to reduce traffic accidents and to drive more freely. Traffic sign recognition system meet this need. This study includes traffic sign detection and recognition application. In this study, some image processing techniques are used to detect traffic signs and Fuzzy Integral is used to recognize traffic signs. Both more accuracy rate results and low computational cost are obtained in terms of recognition stage by using positive aspects of algorithms taken as input parameters with Fuzzy Integral in the traffic sign recognition system. Experimental results show that proposed method gives high accurate results in a reasonable time. INTRODUCTION: Vehicle driving has become more and more common in the life of people. Thus, the traffic security is very important. Now-a-days traffic is becoming a major issue. People tend to drive their vehicles in a very hazardous manner. This deliberately results in accidents. Also various people lose their life due to harsh driving by the drivers.Various people ignore the traffic signs. The traffic signs tell us about the nature of the road and the situation of the environment .The traffic signs tell us how to drive in a systematic way without generating harm to the living resources like the humans, animals, environment ,etc. Hence traffic signs plays a major role in every human’s life. Traffic signs are used for traffic warning, regulation, routing and management as one of the important information for autonomous vehicle. TSR system extracts valuable information from the images taken by the camera. In the first step it takes the images from camera. Various traffic symbols are present which can be deliberately used to ease the driving process. Almost a large range of traffic symbols occur while travelling from one place to another. These traffic symbols guide us throughout our journey. Image processing is widely used for this process. It is nothing but processing and working on an image. Various operations are carried out on the image. These operations lead us to the final output where the image is captured and recognized. Basically it starts with the block creation process. Here the image is divided in number of blocks and processed accordingly. After that the colour of the image is identified whether it is red, green, blue, white and black. Further the block labelling process is done .This can be done with the help of block creation algorithm. The images which are correlated with each other are combined. Region of interest (ROI) which may have traffic sign is extracted in second step. It makes use of the colour and shape information for detection. This step should be strong and fast enough to diminish the total processing time of TSR of detected traffic. The capturing of the images should be done in fraction of second or else there will be no use of our system. In recent past a lot of research is carried out for the robust TSR system in literature. Many of them used the colour and shape segmentation for traffic sign detection. C. Liu, made TSR system in three phases: a new ROI extraction, the split flow cascade tree detector, and a rapid occlusion robust traffic sign classification method based on the extended sparse representation classification (ESRC). Further the edges of the images are analysed so as to find of the images that are related with each other. Finally the images will be detected and the next process is to recognize the given image. Here the Fuzzy Integral plays a major role. The fuzzy integral is nothing but an abstract identifier. It is a user friendly method .It provides us with a platform where we can write and describe our own rules. This can be done according to the convenience of the system. Centroid of the given images is taken. We can change the rules as the system gets updated. Hence a system for the traffic symbol identification is needed and it has vast range of applications. Due to this the driving process can be made easier and more relevant from the user’s point of view. 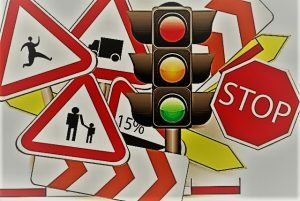 LITERATURE SURVEY: This article describes the high performance done but the traffic sign reorganization which helps us to rapidly detect and recognize traffic signs which are in multiclass. These are comparatively high resolution images. This system frame work mainly consist of three parts: A novel region of interest extraction method (ROI) high contrast region extraction (HCRE), the split flow cascade tree detector (SFC-Tree Detector).This helps us to maintain a good balance between the detection rate and extraction rate. This system is used where high accuracy is needed. We have developed a ROI to process the high resolution which comparatively requires high speed and more accuracy. This article narrates that it is very important in a very short time span and the behaviour must be robust. It is necessary to enhance safety driving which uses the various transform methods It also consist of the histogram based feature which helps in reducing the time required for the detection of traffic signs It consist of various learning based techniques which are used to reduce the feature dimension. Firstly it introduces a RIBP histograms and secondly it uses learning based techniques to achieve feature dimension reduction. This article presents the automatic traffic sign reorganization system which can throughout help the driver to take the right decision at the right time to make the driving process easier. It makes use of the algorithm which captures the images from the complex road environment. The traffic sign is classified into sub group’s .The correct reorganization rate is observed about 92%. It also uses the Euclidean distance method for the shape classification which is very efficient. This system explains how the traffic signs can be detected when the colour analysis is not available. This article represents a different approach which can deliberately detect the traffic signs without the colour attributes. It is based on the two stage sliding window which detects the traffic signs in the multiscale images. Various experiments to detect traffic signs in different traffic conditions such as sunny, cloudy fog etc. This article elaborates that comparatively interest is generated for developing the application such as advance driver assistant system. It is related with the TSD and TRS concepts. TSD is related with locating the traffic sign images where as TSR is concerned with what type of sign the system is looking at. For the speed sign detection Radial symmetry detector can be a feasible approach. In the HOG frame work the colour information can be used. Based on these observations a colour based ROI refinement strategies inserted between the traffic sign detection and reorganization. This article introduces detection. Reorganization and classification of traffic sign which are necessary for advanced driver assistance system and autonomous vehicles. It is machine learning based sign recognition scheme. Based on various observation the sign share same category a common attributes in appearance for such scenario. The proposed scheme first distinguishes each individual sign category from the background an efficient system is develop that simultaneously recognized multiple categories. This data set reasonably show good performance with an average on 97.5% true and 0.3% false. 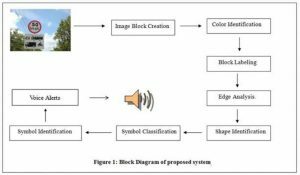 This contribution analyses that Digital Traffic sign recognition has been an advance recurring application based on domain for visual object detection the data set have reached a very large size and it consist of proper empirical case study. This article tackles the problem of tracking based traffic sign recognition system. This system gives the information about object detection association tracking approach based on data fusion. This algorithm tracks the required signs in order to reduced false positive. It is the region of interest concept from the vehicle mounted camera images. A corner detector is associated to insure detection efficiency. Thanks to this solution to feedback loop between tracking algorithms an ROI detector. III. PROPOSED SYSTEM: The proposed system initially takes the traffic image as input to process it into required blocks and then to store it in an image vector. Then every blocks are analysing for the traffic symbol protocol to label them accordingly. Based on the label and block position edges are evaluated then features of each blocks are been identified. These features are stored in vector to feed to Pearson correlation to identify the traffic image from the given input image. Once the image is recognized the related voice alerts are given to the user. This will comparatively guide the user about which actions needs to be performed. The proposed methodology of traffic symbol detection overview can be seen in the figure below. CONCLUSION: This article surveys most of the work related to the traffic symbol detection system. And eventually comes to a conclusion that each system is having one or more deficiency to identify the traffic symbols. So this article reveals some facts of proposed idea to contribute bit to this concept as discussed in the prior section.